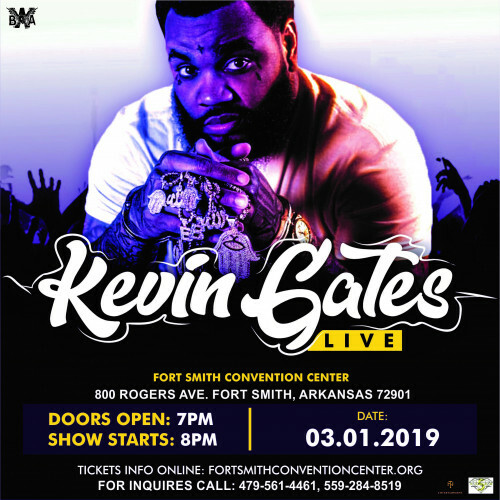 Buy tickets online, https://www.itickets.com/register/new/416100 or at the FS Convention Center Adminstration Office, located at 55 South 7th Street now through Thursday, Feb 28th until 4:00pm. Box Office, located on NORTH end of building, facing Rogers Ave, will be open prior to doors opening for Will Call & ticket sales. Kevin Jerome Gilyard (born February 5, 1986), better known by his stage name Kevin Gates, is an American rapper, singer, and entrepreneur. He is currently signed to Bread Winners' Association with a partnership with Atlantic Records. His debut studio album, Islah, released in January 2016 and peaked at number two on the US Billboard 200 chart. Prior to Islah, Gates also released numerous mixtapes including Stranger Than Fiction, By Any Means, and Luca Brasi 2, all of which peaked in the top 40 on the Billboard 200 chart.